Bedtime Balloons, the latest iPhone app from Round Trip Software, is now available on the App Store. The app is for parents looking for a little help restoring some order to bedtime. 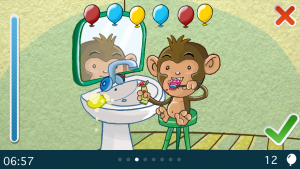 Bedtime Balloons is a fun, game-like experience designed to help kids focus on their next task such as brushing teeth, taking a bath, and more. Why nag your kids when you can just say, “Check the app!”? Bedtime Balloons is flexible and simple to use for parents and kids. Parents set up routines exactly how they want. Set up a school bath night, a relaxed weekend night, or create any kind of routine that you want with your own photos. Try it for your morning routine, chores, or homework. Set time limits on each task as needed, and arrange tasks in the order you want. Your child follows the routine using simple visual controls. No reading is required. Balloons are earned with the successful completion of each step. If your child takes too long on a job, he or she loses balloons to a pesky flying bug. Once ready for bed, your child get to pop his or her collected balloons and see what treats are waiting inside. The app is designed to be safe for young kids. It has no ads, no in-app purchases, no social media, and no linking to websites. See the FAQ and the app’s marketing page for more information. This app is kid-tested. Our four-year-old daughter loves racing the monkey to bed. We hope it works for you too!